I really had no idea that there was a race for solar powered vehicles, but apparently there is a 2010 American Solar Challenge, a 1100 mile race from Tulsa to Chicago. This particular solar-powered car is one of the competitors. 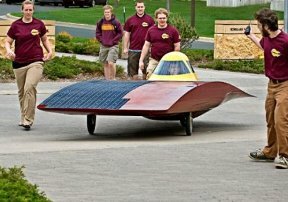 It is made by The Solar Vehicle Project team at the University of Minnesota, and it is called the Centaurus 2. You will note the driver of this vehicle, and I can’t tell if he (I’m assuming it is a he) is off center or not. It might just be the angle of the shot, but he looks a little off-center. It does look like the vehicle has three wheels, though. My source does tell me that this car is about 3 feet tall, 16 feet long, and 6 feet wide. It weighs at 400 pounds, which is pretty light compared to a car. You will note the solar cells on it. I think it’s interesting that they seem to adorn only half the vehicle. I don’t know if that’s part of the design, or perhaps the solar car isn’t finished yet. Too bad that can use the solar cells that can be printed on paper that we reported on yesterday. Too bad someone can’t invent a paint that works like a solar cell when you put a coat of it on anything.